Yesterday [Dec 7] Premier Michael Dunkley spoke at an event hosted by the Association of Bermuda Insurers and Reinsurers [ABIR], and congratulated the Bermuda Monetary Authority [BMA] team on their successful work to achieve an equivalence finding from the European Commission under the Solvency II insurance regulatory scheme. The finding benefits European markets by allowing greater cross border trade between Bermuda and the EU; and aids Bermuda insurers by allowing for more efficient group regulatory supervision. 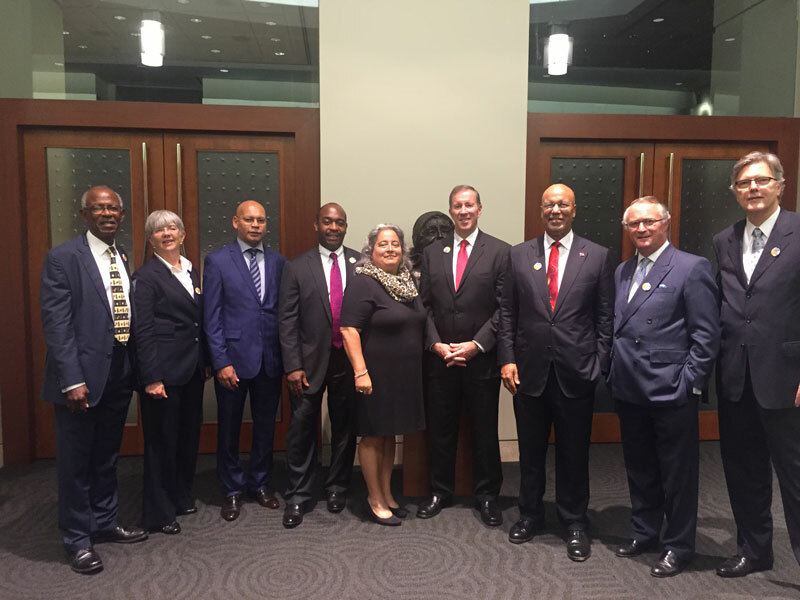 From left to right: Gerald Simons, Chair, Board of Directors, Bermuda Monetary Authority [BMA]; Shauna MacKenzie, Director, Policy, Legal and Enforcement, BMA; Craig Swan, Managing Director, Supervision, BMA; Jeremy Cox, CEO, BMA; Leila Madeiros, Senior Vice President and Deputy Director, ABIR; Premier Michael Dunkley; Minister of Finance and Deputy Premier Bob Richards; Stephen Catlin, Chair of the Board, ABIR, and Executive Deputy Chair XL Group plc; and Bradley Kading, President and Executive Director, ABIR.